Senior Alan Flores tries Tuesday to beat the defender during Moffat County High School's boys soccer game vs. Colorado Rocky Mountain High School at Loudy-Simpson Park. Flores scored two goals, but Moffat County lost, 4-3. 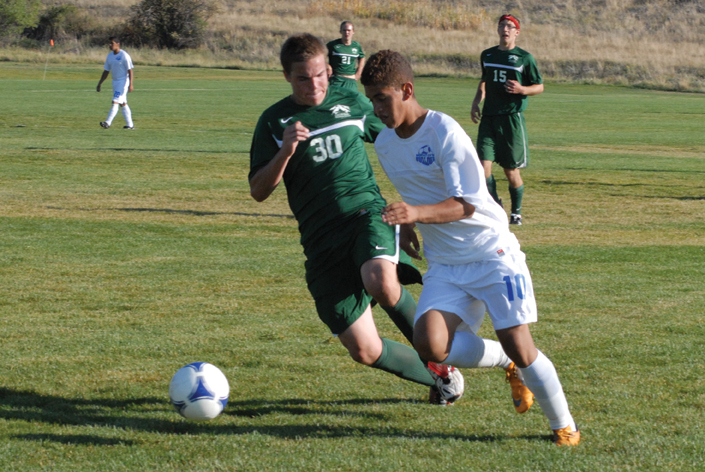 The boys soccer team from Moffat County High School suffered another tough defeat Thursday after surrendering another late goal under odd circumstances. The Bulldogs played Colorado Rocky Mountain High School Thursday afternoon at Loudy-Simpson Park, and while the weather was much nicer than the team’s game Tuesday vs. Rifle, the result was similar. MCHS battled from behind for much of the game to gain a 3-3 tie, but gave up a goal with just over six minutes to play and lost, 4-3. The goal came after a punt from the Rocky Mountain goalkeeper, which was allowed to bounce and then was misplayed by Moffat County defenders, which resulted in an easy, game-winning goal. The loss was another difficult one for the Bulldogs, who fell in overtime to Rifle Tuesday. Head coach Rusty Cox said he knows what will be worked on in the team’s upcoming practices. Cox played five midfielders Thursday, an alignment that looks to control the ball, especially in the middle of the field. But he said too often his midfielders were either too far back or too far forward, and that puts the team out of position. Another problem for the Bulldogs was losing three starters to injury over the course of the game, including senior Bryant Cox, the team’s leading scorer coming into the game. Still, Cox chose to look at the positives coming from the game. The Bulldogs’ next game is at Berthoud High School at 1 p.m. Saturday. It will be another opportunity to correct their previous mistakes.